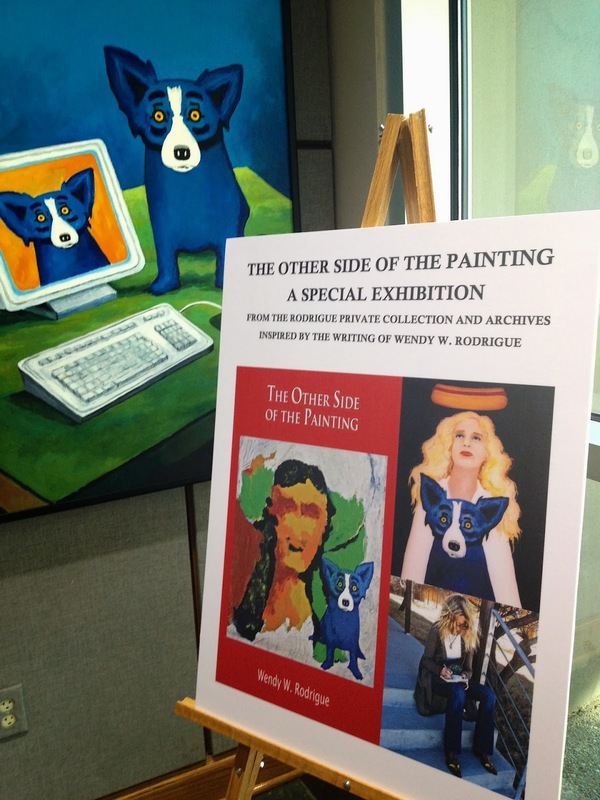 This month, the State Library of Louisiana premieres an exhibition based on a new Rodrigue book, The Other Side of the Painting, on view through February 2014. 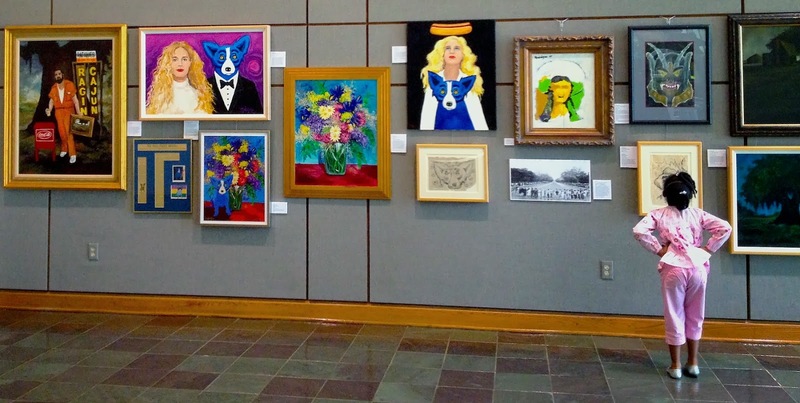 Unable to attend the November 2nd opening in Baton Rouge, George Rodrigue and I relied on curator Marney Robinson, who astonished us with her ability to fully utilize a one-walled space at the library’s entrance. To create the exhibition, Robinson borrowed paintings by various artists from within our personal collection, including George Rodrigue’s original works from his archives, corresponding to vignettes from the UL Press publication, The Other Side of the Painting. Eleven of the sixteen pieces are on public display for the first time. “This exhibition gives viewers a taste of the original art that inspired Wendy to write her book," explains George Rodrigue. “This includes not only my early art, but also paintings from her mother and interesting photographs, such as the King Tut line at the New Orleans Museum of Art from 1977. 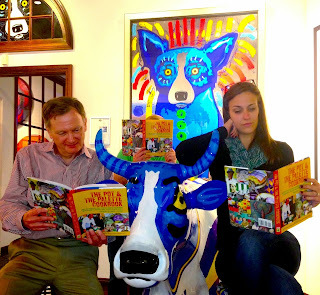 …says Bethany France, Director of Louisiana A+ Schools for the George Rodrigue Foundation of the Arts (GRFA), who joined Robinson for the exhibition’s premiere during the Louisiana Book Festival this weekend. Simultaneously, our foundation unveils its latest project, a cookbook in partnership with the Louisiana Restaurant Association. The Pot and the Palette features award-winning student artwork from GRFA’s annual scholarship art contest, including recipes from Louisiana’s greatest chefs and restaurants. Although not quite a George Rodrigue biography, The Other Side of the Painting is the closest publication to date, a memoir recounting our personal histories and our love of the arts. As a result, this exhibition is revealing as well, explaining the origins of some of Rodrigue’s most famous works through the photographs, artists and histories that inspired him. 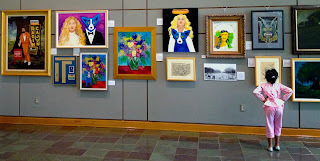 The wall also includes original Rodrigue sketches and student artwork, including his Creature from the Black Lagoon from 1957, as well as the book's cover image, painted on illustration board while Rodrigue studied at the Art Center College of Design in Los Angeles, 1965. Other works include his original Ragin' Cajun (1979), a classic 1969 landscape, and a painting from the Xerox Collection (2000). This posted at 6:30 CDT November 2. I hope it was a good day. Hi Patty--- Yes, I was posting images from the day's exhibition opening. George and I were unable to attend; however, the exhibition remains up through February 2014, so we do hope to visit at some point, and hope others will too, as the works and vignettes are a unique collection, all inspired by "The Other Side of the Painting." Did you miss the book festival, too? If so, I'm sure the book was still a big headliner! Unfortunately I had to cancel my events and signing at the last minute. But the exhibition has received great feedback, as has the book. Maybe next year you and I will go together! Oh, Wendy, this looks grand. I will make sure I travel from Texas to Baton Rouge to see the exhibition at the State Library of Louisiana before the end of February. This gives me another excuse to travel to my beloved Louisiana and see my cousins in St. Martinville, Baton Rouge, and New Iberia. Wonderful! It's a small exhibition, but quite special ---and definitely something Rodrigue fans will study and savor. The State Library is open Monday through Thursday from 8 am - 4:30 pm. We are closed Friday, Saturday, and Sunday.